Stainless steel does not rust; however, contact between a bicycle and bike rack can leave small specks of mild steel from the bike which embeds into the surface of the stainless steel bike rack. These small specks can rust, marring the surface of the rack. Dero's Rack Renewal to the rescue! Rack Renewal is a high quality blend of chemicals formulated for cleaning, rust removal and passivation of stainless steel products. It comes in 22oz. trigger spray bottles with a Scotch-Brite™ scrubbing pad. 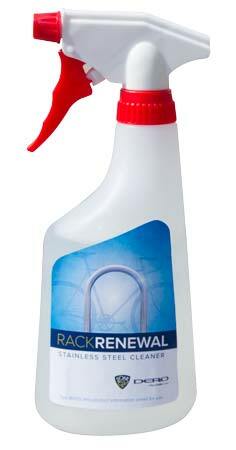 Rack Renewal is a portable, low cost product which will help your bike racks look as good as new.